Police have shot a man on a street in south-west Birmingham, leaving him in a critical but stable condition. 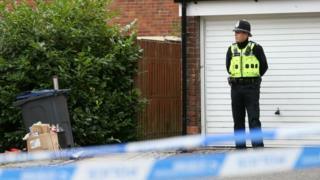 An armed officer fired his weapon in Hereford Close, Rubery, at about 21:00 BST on Wednesday. West Midlands Police said it "resulted in one man being taken to hospital with a gunshot injury". Armed officers were called to the road after reports of a firearms incident, said the police watchdog which is also conducting its own investigation. One man aged 21 was arrested for suspected firearm offences. Two other men, aged 17 and 20, and a 53-year-old woman were arrested on suspicion of drugs offences. Eyewitness Simon Hodges said: "I was sat in the back garden and I heard a bang, so I come out the front and I see armed police running up and down the road with a police dog. "I was told to get back in my house and that's where I went. It was very scary." West Midlands Ambulance said the injured man, in his early 40s, had a chest wound. The armed officer's body-worn video camera was switched on at the time, with the footage gathered by the Independent Police Complaints Commission (IPCC). "A police firearm has been secured. There is early evidence to indicate a single shot was fired by one police officer," the IPCC said. IPCC Commissioner Derrick Campbell said: "We will be carrying out a thorough, independent investigation into this serious incident, as is appropriate when police use potentially lethal force. "We are making contact with the man's family and will ensure they are updated on the progress of our investigation." The force's police and crime commissioner David Jamieson said: "In fact, the last time someone was shot by an officer in the West Midlands was actually 17 years ago in June 2000 and it's been over 20 years since someone was fatally shot by a police officer."